weditorial™ | a wedding and event planner's blog » Featured » A Little Black Book of The Best Kind! A Little Black Book of The Best Kind! Today I have an exciting announcement! 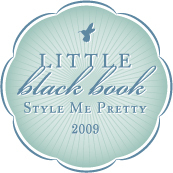 I’m thrilled to share the news that A Flair for Affairs has been added to Style Me Pretty’s “Little Black Book of The Best Wedding Vendors”! Style Me Pretty relies on recommendations from industry insiders, trusted LBB vendors and Style Me Pretty readers to identify outstanding service providers. Each invitation to participate is followed up with a personal interview to assure that vendors meet SMP’s high standards! Clearly this is a huge honor and I’m elated to be included among the country’s top wedding vendors! The exclusive nature of the directory allows for only a few vendors to be showcased in each region. For example, there are only three event planners featured in Central Florida and I’m absolutely delighted to be the only wedding and event planner based in Orlando! I urge you to check it out on a regular basis because it’s incredibly inspiring! PS: Is A Flair for Affairs in your little black book? ← Hilton Orlando Grand Opening was a Grand Affair! Congratulations Elisa! As a true gem in our industry, the listing is only one of the many rungs on your ladder of success. The LBB made a great choice in selecting AFFA! Thank you, Kerline! It means a lot to have the respect of true professionals such as yourself.